The size of the portions matches the size of their hunger. This is a great way to introduce them to New Mexican cuisine. 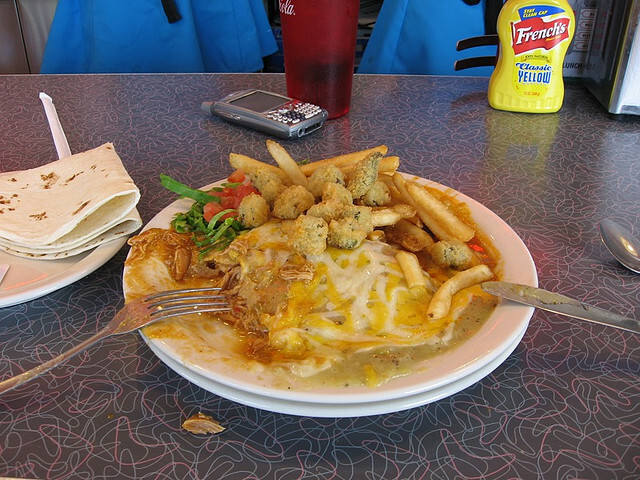 If they balk at Chiles, there is plenty of traditional fare to satisfy them. The place is a hoot. 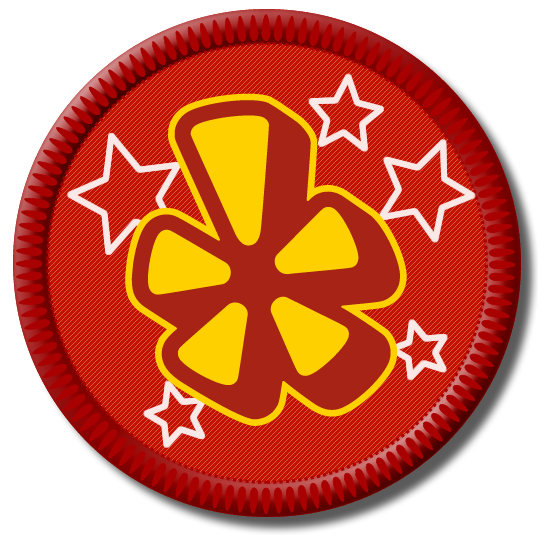 I love it, and my guests love it, too. 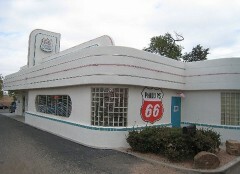 The building is from the Art Deco Diner school of architecture. The decor is ’50s eclectic. Sit on a stool at the long counter and rub elbows with serious eaters, who more likely than not will strike up a conversation with you, and you will feel like you have made a new friend. The food is ’40s, ’50s, and ’60s diner food, and the decorations are from the same era. Elvis. Marilyn. Fords and Chevys. Music from that period blares from the jukebox. Chicken Fried Chicken with green chile gravy. 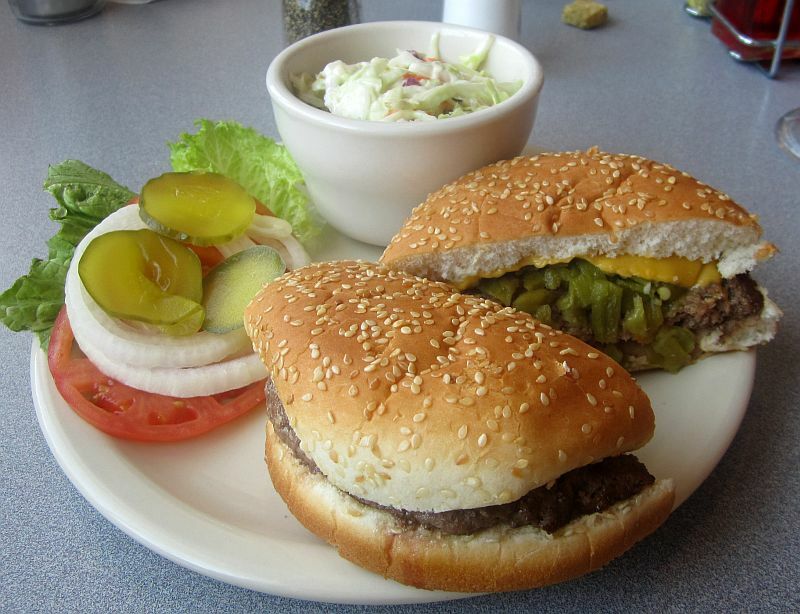 Green Chile Cheeseburgers (good, not great). Meatloaf, liver and onions, and lots of familiar dishes that your mother made for you. There is a difference — your mother probably didn’t cook nearly this well. World-class milkshakes. Rich and thick. Get two. I usually have a chocolate malt. Superb. Chicken Fried Chicken— Tender chicken breast, hand-breaded and deep fried. Served with your choice of cream or brown gravy, two sides, and a dinner roll. Side choices: French Fries, Fried Okra, Vegetable of the Day, Beans, Potato Salad, Cole Slaw, Mashed potatoes and gravy. This is my favorite dish at the 66. Beautifully done, tender chicken breast is delicious. 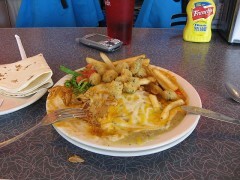 Would that all diner food were this good. Get it smothered with the cream green chile gravy for a little piquancy [you may have to ask for the chile to be added, but they will accommodate you], and make sure that the expertly fried okra is one of your sides. Cole Slaw is usually my second choice. Warning: This is a calorie buster. 66 Diner’s fresh burger platters come fully equipped with mustard, mayo, lettuce, tomato, pickle, onion and your choice of fries, chips, potato salad or cole slaw. My personal choice for GCCBs is to have them prepared competition style: beef patty, gloppy cheese, and green chile served on a nondescript bun. My GCCB for lunch today was good, but not great. Cooked the way I requested, it could have been juicier and tastier. Good gloppy cheese. The Green, however, lacked piquancy and had no fire-roasted smoky taste, as if they were spooned out of a watery mixture from a distributor’s jar. They were cold, and did not allow the melted cheese to wrap around them. It’s as if they were added on top of the cheese after the burger had finished cooking. Poor technique. Good, bit it will never make it onto my top-ten GCCB list. Nonetheless, I keep coming back for this burger. My out-of-town guests love it, and the Green is not too hot for them. 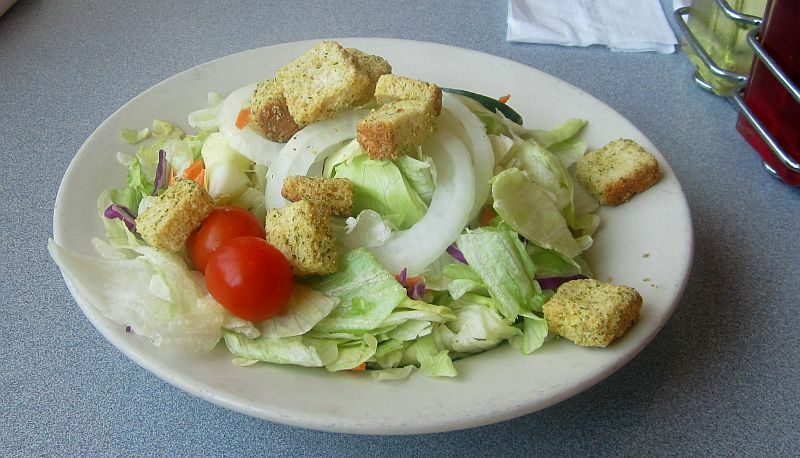 No diner menu is complete without a simple Luncheon Salad for the dieters. This one is pretty good. And cheap. Everything is very fresh and tasty. If you are on a special diet, you can bring your own tofu and slice it into chunks and arrange it on the top. All my friends leave this place muttering, “Wow. Let’s come back.” It’s alright with me. Just say when. History lesson and good food. A winning combination. “Route 66, America’s highway, meandered across 2,448 miles of the fruited plain, crossing three time zones and eight states, from Chicago to Los Angeles. 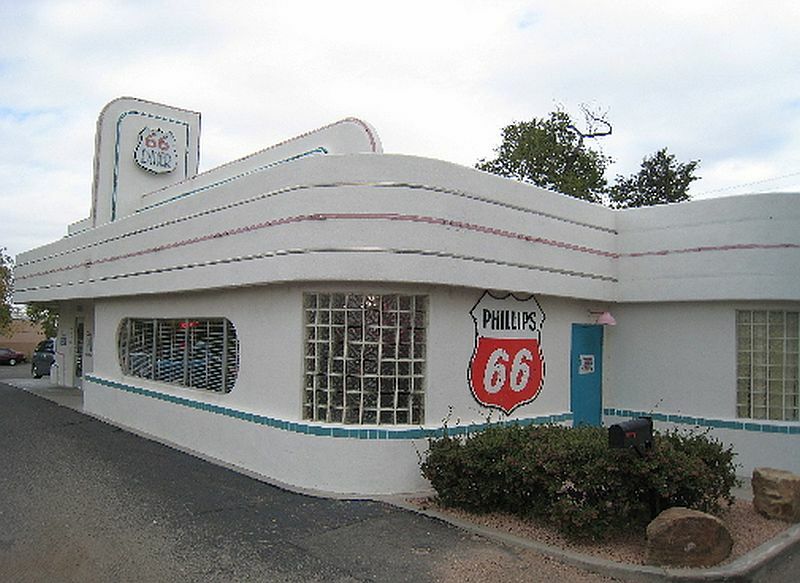 Although Route 66 has all but disappeared, been renamed (as in Albuquerque’s Central Avenue) or left for nature to reclaim, the spirit of the roadside diner continues to thrive in neon spangled restaurants like the 66 Diner. This entry was posted in American, Burgers, Diner, New Mexican, Sandwiches. Bookmark the permalink. Yo there The Larry: Ooo Ooo…..Next time “Ya gotta have A Sloppy Joe!” (which I say as in akin to http://tinyurl.com/7cjkp4l) with potato chips. Albeit from “dinerville” New England of the ’50s, never had one till a college roomate made one from scratch way out in LA. 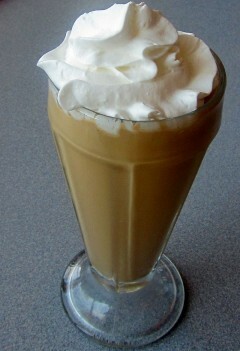 Alas, wish the 66 Diner would make MA frappes (milk, ice cream and ((e.g. coffee)) flavored syrup whipped till aeratedly liquified) to make a comprehensive, gastronomical delight. PS don’t forget the humongous display of PEZs. PPS: Say, are you going to be on KRQE’s New Mexico Style show some upcoming morning? Nikki Stanzione is scheduling an appearance on her NM Style (KASA 2) in the near future. Stay tuned.